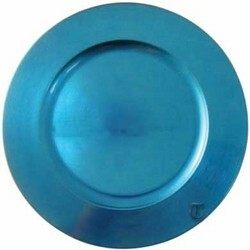 Tabletop Classics Round Acrylic Blue Charger Plate 13"
Home > Products > Tabletop Classics Round Acrylic Blue Charger Plate 13"
Add a pop of color to your table setting with the Tabletop Classics Round Acrylic Blue Charger Plate 13". Designed to provide a striking backdrop for dinnerware, this product boasts a glossy blue metallic finish that looks festive and inviting. Suitable for holiday events, formal affairs, and upscale dining, this piece coordinates well with a variety of table decors. This perfectly sized, versatile charger is not only used for aesthetics but also to protect tabletops from spills and mess. Hand washing is recommended to properly clean and maintain this eye-catching charger plate.